A Nation at Risk The U.S. Department of Educations National Commission on Excellence in Education published the report, A Nation At Risk, in 1983. This. 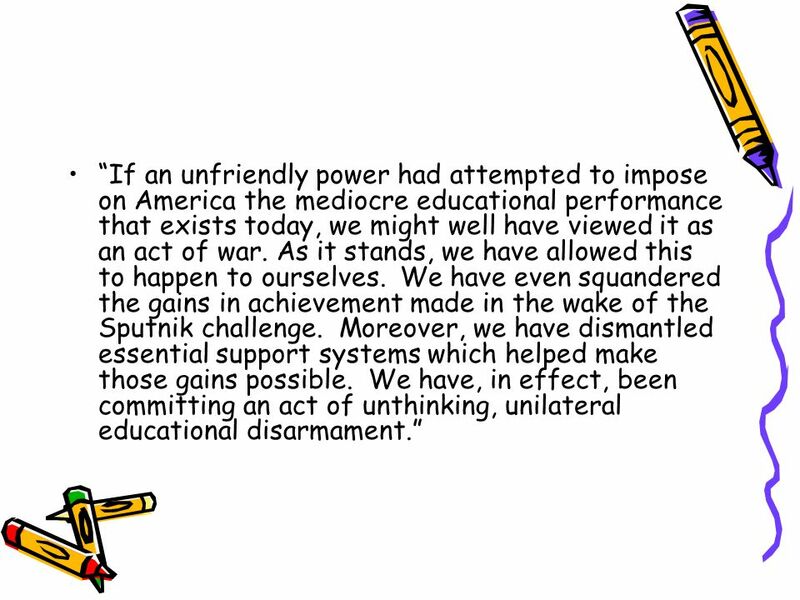 2 If an unfriendly power had attempted to impose on America the mediocre educational performance that exists today, we might well have viewed it as an act of war. As it stands, we have allowed this to happen to ourselves. We have even squandered the gains in achievement made in the wake of the Sputnik challenge. Moreover, we have dismantled essential support systems which helped make those gains possible. We have, in effect, been committing an act of unthinking, unilateral educational disarmament. 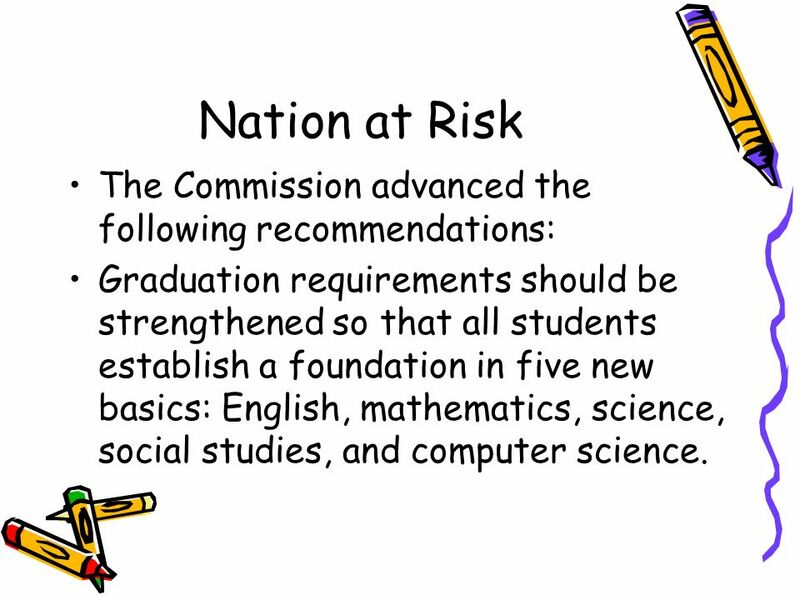 3 Nation at Risk The Commission advanced the following recommendations: Graduation requirements should be strengthened so that all students establish a foundation in five new basics: English, mathematics, science, social studies, and computer science. 4 Schools and colleges should adopt higher and measurable standards for academic performance. The amount of time students spend engaged in learning should be significantly increased. The teaching profession should be strengthened through higher standards for preparation and professional growth. 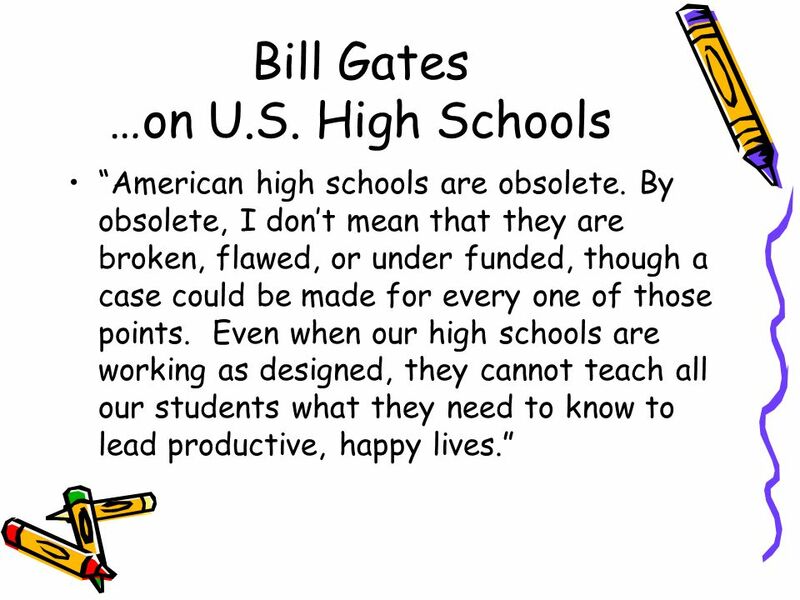 6 Bill Gates …on U.S. High Schools American high schools are obsolete. By obsolete, I dont mean that they are broken, flawed, or under funded, though a case could be made for every one of those points. Even when our high schools are working as designed, they cannot teach all our students what they need to know to lead productive, happy lives. 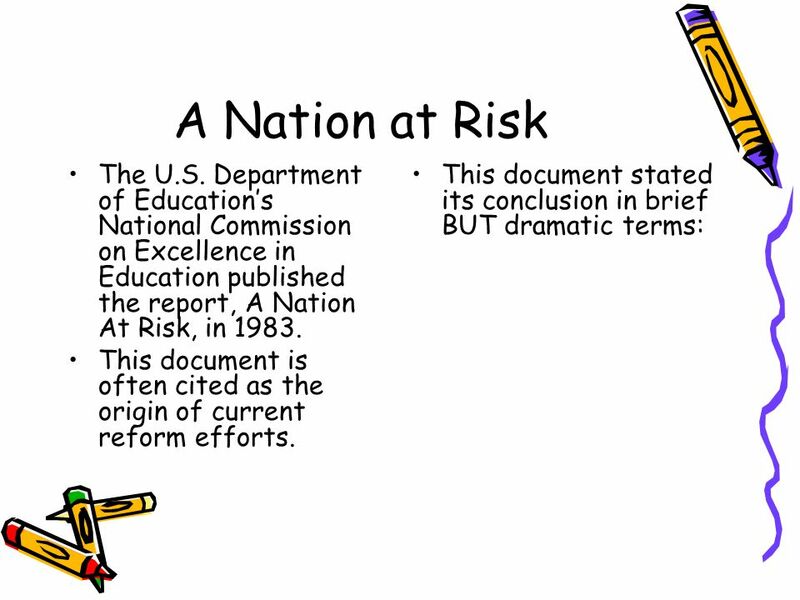 Download ppt "A Nation at Risk The U.S. Department of Educations National Commission on Excellence in Education published the report, A Nation At Risk, in 1983. This." Poplar School District Education Report Fall 2012. SCIENCE. Science For current grade 9 students Grade 10 Science (Apply or Academic) is a mandatory course Taking multiple science courses in a year is. Achieving the Dream. Achieving the Dream is a national effort to help more community college students succeed, with a special focus on students of color. Preparing Your Application for the Gates Millennium Scholars Program. 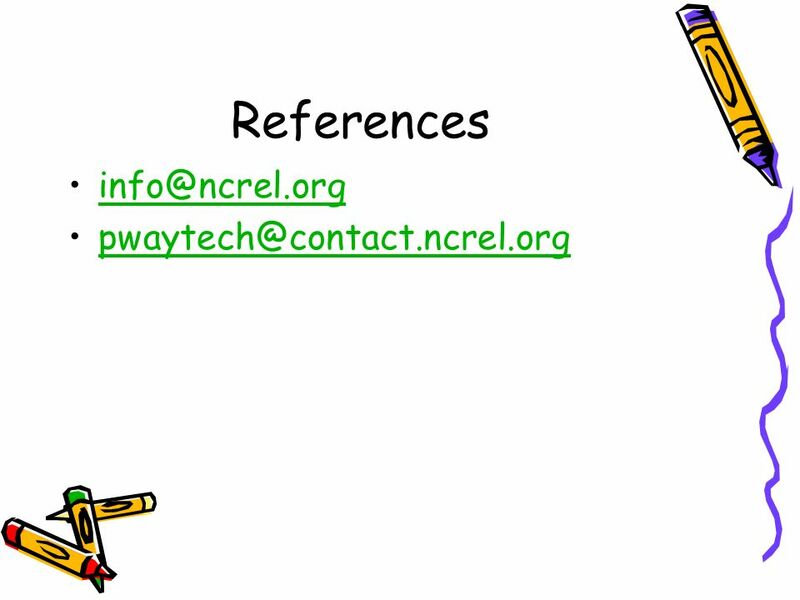 Recognizing Educational Success, Professional Excellence and Collaborative Teaching The Case for RESPECT. The Status of the Teaching Profession 2003 The Center for the Future of Teaching and Learning California State University, Office of the Chancellor Policy. Arkansas Advanced Initiative for Math and Science Results Tommie Sue Anthony 1. Educating in an Era of Fear, Panic, Misinformation, and Exaggeration John Kuhn - educator, speaker, author TASSP Summer Workshop June 11-13, 2014. Latino Student Success and America’s Future NACADA Annual Conference October 2, 2009. Center of Excellence in Mathematics and Science Education Cooperative Partners College of Arts and Sciences College of Education Dr. Jack Rhoton East Tennessee. Florida Association of Science Supervisors Florida Department of Education Update May 5, 2005 Susan McNally Director Office of Curriculum Support. Assuring Diversity….Growing California’s Leaders : The California Aspire Achieve Lead Pipeline Project (CalAAL) Winston C. Doby September. Government and Innovation Partnership or Oxymoron? Vernon J. Ehlers, Ph.D. U.S. House of Representatives. The Toolkit for Community-Engaged Scholarship: Successfully Navigating the Faculty Promotion and Tenure Process Sarena D. Seifer, Jen Kauper-Brown, Diane. U.S. Department of Education Dennis W. Bega West Virginia Alternative Education Conference Charleston, West Virginia June 29, 2010. Lynda Hoffpauir EDLD 5362 – ET $ Technology Expenditure Per Pupil 3 Student(s) for every computer 1 Teacher(s) for every computer.